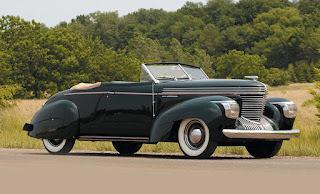 Over at The Jalopy Journal, there is a great pair of posts ranking great automotive designs from the '30s and 40's (the series also continues into the '50s and '60s). 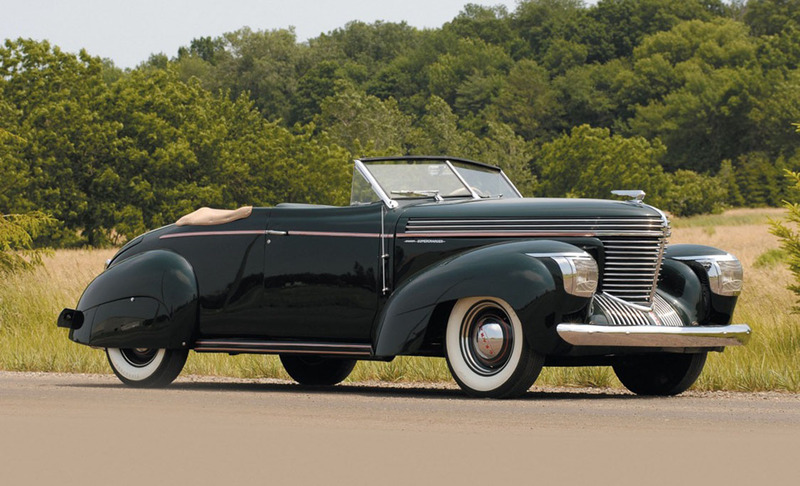 I have to agree with many of the picks, including the 1939 Graham (a/k/a "Sharknose") convertible pictured here. This animated short is a very early Van Beuren Studios production featuring Brownie Bear as a South American cowboy in a classic old West adventure, complete with senoritas, banditos and Latin music. From the Internet Archive, here is The Gay Gaucho. Today's Sunrise Serenade was "Swinging On A Star" by Bing Crosby. Click on the song title to listen courtesy of Jazz On Line. To most Americans, he was the Nazi major shot by Humphrey Bogart in the final scenes of Casablanca; but after reading the brief biography of Conrad Veidt posted on MovieFanFare, you will learn a great deal about this versatile actor and courageous man. One of the most outspoken critics of the Nazi regime, during the war, Veidt donated almost all of his salary to support the British war effort. One of his greatest roles was as the murderous sleepwalker (photo) in The Cabinet of Dr. Caligari (1920). This morning's Sunrise Serenade was "Sam Jones Done Snagged His Britches" by Louis Jordan and His Tympani Five. Click on the song title to listen courtesy of Jazz On Line. The playlist for the April 25, 2012 broadcast of the Swing Shift Shuffle has just been added to the playlist filing cabinet. Back in September 2009 (I've been doing this blog for that long? ), I posted a 1933 article from the Modern Mechanix blog about the beginnings of the Mount Rushmore project. Low and behold, I came across this December 1942 issue of Mechanix Illustrated, also on Modern Mechanix, about the completion of the giant monument. Today's Sunrise Serenade was "Swanee River" by Jimmie Lunceford and His Orchestra. Click on the song title to listen courtesy of Jazz On Line. 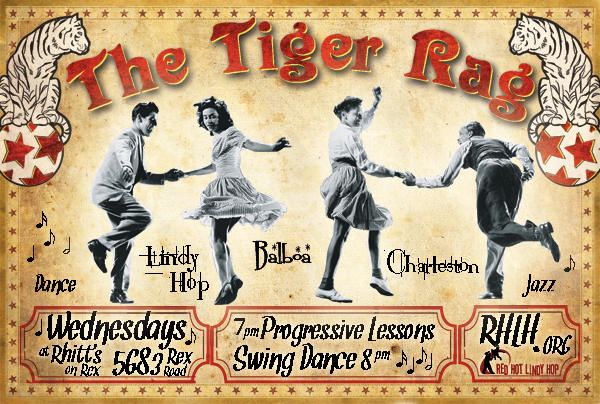 The Tiger Rag happens tomorrow night and every Wednesday at the Madison Dance Studio inside Minglewood Hall at 1555 Madison Avenue at 8:00 p.m. You can also sign up for dance classes every Wednesday night at 7:00 p.m. More info here. The Red Hot Lindy Hop lesson and session returns to the Rumba Room this Friday night with free admission and lesson before 7:00 p.m., and $5 cover at the door afterwards. The lesson will be by Annabel and Michael Q with music by Michael Q. Dress like you are going out! This morning's Sunrise Serenade was "Henderson Stomp" by Benny Goodman and His Orchestra. Click on the song title to listen courtesy of Jazz On Line. Now here is an interesting twist, posted on Four Color Shadows - a human (i.e. non-super-powered) hero whose gadgets are all designed to help him fight fires. He is a crime fighting fire fighter! 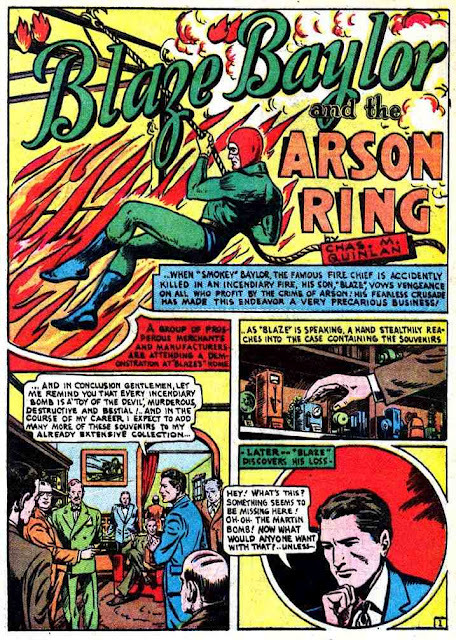 "Blaze Baylor" uses a grappling rope, a chemical (fire retardant) gun, and a fireproof suit made of "imperbestos." Today's Sunrise Serenade was "Cotton Tail" by Duke Ellington and His Orchestra. Click on the song title to listen courtesy of Jazz On Line. Here is a Famous Studios animated short from 1947 featuring Little Lulu. In this cartoon, Lulu gets the shaft when a golfer who hired her to caddy fires her without payment. She and her frog, Qunicy, soon collect the compensation. From the Internet Archive, here is Cad And Caddy. This morning's Sunrise Serenade was "Twee-twee-Tweet" by Cab Calloway and His Orchestra. Click on the song title to listen courtesy of Jazz On Line. I saw this image once before, and initially thought it would make a great logo for the SSS, but there is something wrong. 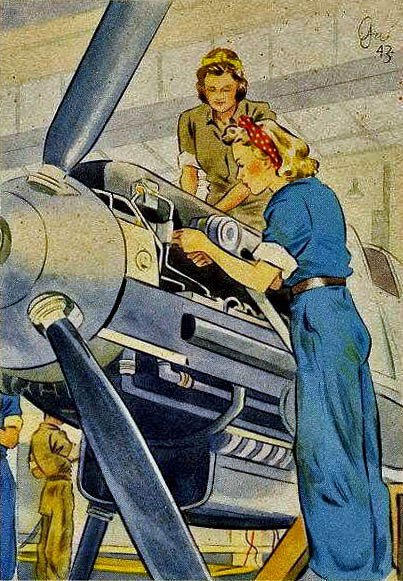 It appears to be two women war workers building an aircraft, freeing the male workers to fight for their country - a very "Rosie the Riveter" image. The problem is that aircraft they are building. It is not a P-40 or P-51. It is a Messerschmidt ME109. That's right folks. These girls are not Rosie the Riveter. They are Hilda the Hausfrau. This image is from a set of German postcards, posted on Retronaut, showing how women were helping the Nazi war effort during World War II. It is interesting to see that the Germans used the same imagery as the Allies for similar purposes. Today's Sunrise Serenade was "I Want A Roof Over My Head" by Louis Jordan. Click on the song title for a sample from emusic, or click here for the album page. The playlist for the April 18, 2012 broadcast of the Swing Shift Shuffle - Spring Pledge Drive Special - has just been added to the playlist filing cabinet. 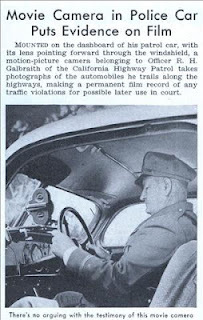 In July 2010, I posted an item about a 1940's news photographer who mounted a camera on his car dashboard. Based on this article from the September 1939 issue of Popular Science, the California Highway Patrol had him beat by a few years, and upped the ante by using a motion picture camera in its patrol cars. The Tiger Rag happens tomorrow night and every Wednesday at the Madison Dance Studio inside Minglewood Hall at 1555 Madison Avenue at 8:00 p.m. You can also sign up in advance for dance classes. More info here. The Red Hot Lindy Hop moves to the Madison Dance Studio and features live music this Friday with the Side Street Steppers. Doors open at 6:30, and Mike and Michelle will give the lesson before the band starts. $7 cover. Dress like you are going out! Today's Sunrise Serenade was that lesson on the Golden Rule, "Do Unto Others" by the Golden Gate Quartet. Click on the song title for a sample from emusic, or click here for the album page. Here is another interesting and (to me anyway) little known comic book crimefighter: "Nightmare" and his sidekick "Sleepy." Like Batman, this hero had no super powers. His secret identity was that of a pro wrestler. Sleepy was his teenage manager. 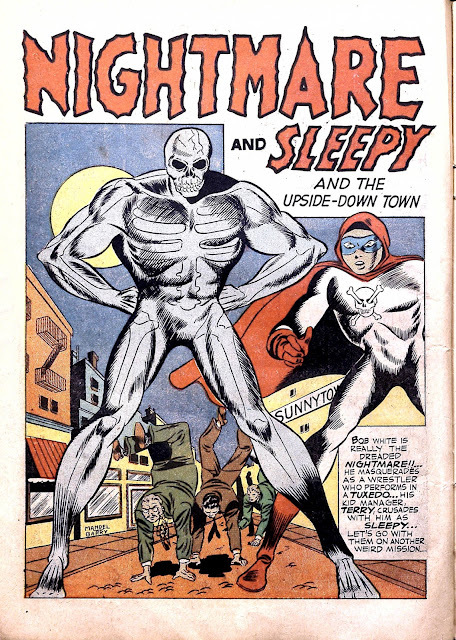 I'm not sure if "Sleepy" inspired the same level of dread in evildoers as Nightmare. 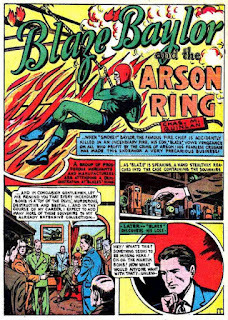 Four Color Shadows posted this 1943 issue of the comic. As the deadline for filing income tax returns approaches, this cartoon seemed appropriate. Walt Disney made this animated short, featuring Donald Duck, for the U.S. Government, so it fell into the public domain. The cartoon's goal was to encourage people to save their money so they could pay their income taxes and support the war effort. From the Internet Archive, here is the 1943 animated short, The Spirit Of '43. Today's Sunrise Serenade was "On The Alamo" by Harry James and His Orchestra. Click on the song title for a sample from emusic, or click here for the album page. Over on Film Noir Photos, there is a set of pics featuring Frances Langford on a USO tour with Bob Hope and friends. In this photo, we see Langford, Hope and pilot in front of his P-40 fighter. Today's Sunrise Serenade was "Swanee Lullaby" by Cab Calloway and His Orchestra. Click on the song title to listen courtesy of Jazz On Line. The playlist for the April 11, 2012 broadcast of the Swing Shift Shuffle has just been added to the playlist filing cabinet. 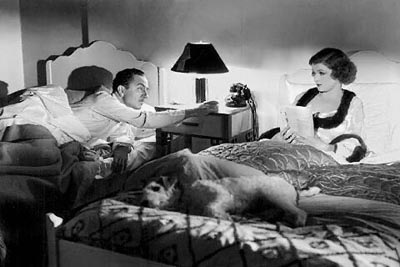 On MovieFanFare, guest blogger Kim Wilson does a nice review of The Thin Man which effectively summarizes the style and chemistry of the first of the Thin Man films, including some of Nick and Nora's great lines. Nick: You wouldn’t be a widow for long. Nora: You bet I wouldn’t. Nick: Not with all your money. 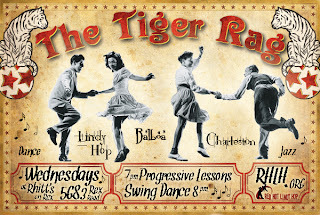 The Tiger Rag happens tomorrow night and every Wednesday at the Madison Dance Studio inside Minglewood Hall at 1555 Madison Avenue at 8:00 p.m. You can also sign up in advance for dance classes every Wednesday night at 7:00 p.m. More info here. The Red Hot Lindy Hop lesson and session continues this Friday night at the Rumba Room with free admission and lesson before 7:00 p.m., and $5 cover at the door afterwards. The lesson will be by Amanda and Kirk with music by Amanda. Dress like you are going out! Next Friday, April 20, the Friday night gig will move to the Madison Dance Studio, and feature live music from the Side Street Steppers, in addition to the free lesson. Today's Sunrise Serenade was "All The Things You Are" by Tommy Dorsey and His Orchestra. Click on the song title to listen courtesy of Jazz On Line. 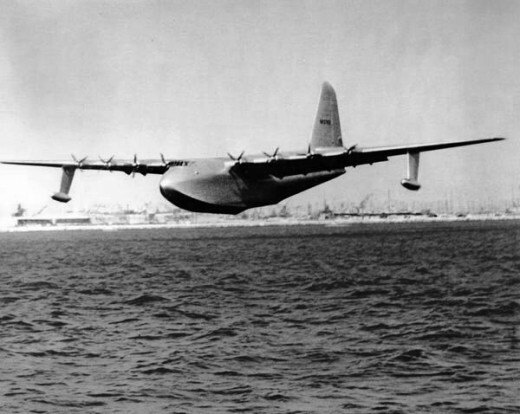 Howard Hughes' "Spruce Goose" made its only flight on November 2, 1947, and Retronaut posted a series of photos showing the massive aircraft in assembly, during that flight, and being transported through traffic to its hanger. This morning's Sunrise Serenade was "I'm Stepping Out With A Memory Tonight" by Jimmy Dorsey and His Orchestra with Helen O'Connell on vocals. Click on the song title for a sample from emusic, or click here for the album page. Due to the continued training of the new SSS personnel (Benjamin & Colleen), the SSS Saturday morning cartoon is moving to Friday afternoon. In this Fleischer Studios short from 1936, "Uncle Max" [Fleischer] draws Pudgy (a dog), who is a bit too sleepy to perform his tricks. Betty draws up a device to give him more pep, and it goes a bit haywire, infusing everyone around with excess energy. There are some fun live action shots in this short. From the Internet Archive, here is More Pep. Today's Sunrise Serenade was "Swing Me With Rhythm" by Louis Prima and His Gang. Click on the song title to listen courtesy of Jazz On Line. 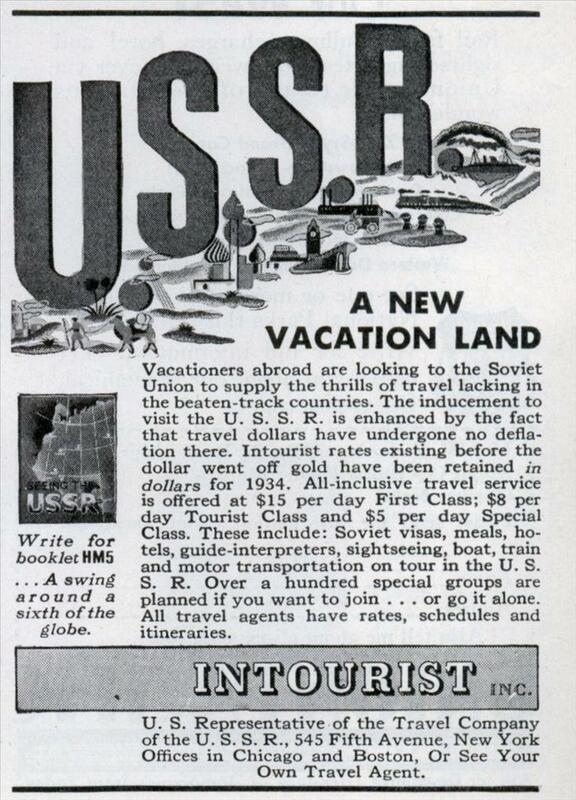 In one of his 1930's travel books (the title of which escapes me), Richard Halliburton visited the Soviet Union. I do not remember all the details, but I know he got married and divorced within a few minutes, to and from his tour guide. This activity, and the rapidity with which it could be accomplished, was apparently a popular tourist attraction. He also visited a school for young circus performers, and interviewed a soldier who gave an account of the execution of the Romanovs. 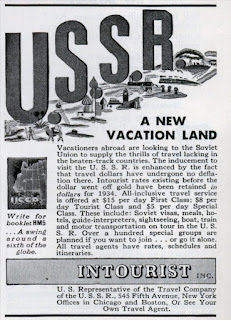 According to this article from the May 1934 issue of Harpers Magazine, posted on Modern Mechanix, visiting the USSR as a vacation destination was not as unthinkable idea as it would be a few decades later. This morning's Sunrise Serenade was "We'll Stand The Storm" by the Golden Gate Quartet. Click on the song title for a sample from emusic, or click here for the album page. The playlist for the April 4, 2012 broadcast of the Swing Shift Shuffle has just been added to the playlist filing cabinet. It appears that cats ruled media even before the internet. I saw this video on Boing Boing. There is no obvious information on the year, but based on the announcer, clothes and equipment - specifically the fire chief's 1936(?) Chevrolet coupe - I'd say this originated in the mid- to late 1930's. While Mickey did not seem thrilled about the fire helmet, and we do not know how he felt about being thrown against the fire pole, he looked like he was a good sport when riding with the chief. Lindys And Tigers And Rags, Oh My! The Red Hot Lindy Hop lesson and session continues this Friday night at the Rumba Room with free admission and lesson before 7:00 p.m., and $5 cover at the door afterwards. The lesson will be by Mike T and Jasmine with music by Bethany. Dress like you are going out! Today's Sunrise Serenade was "King Porter Stomp" by Glenn Miller and His Orchestra. Click on the song title to listen courtesy of Jazz On Line. 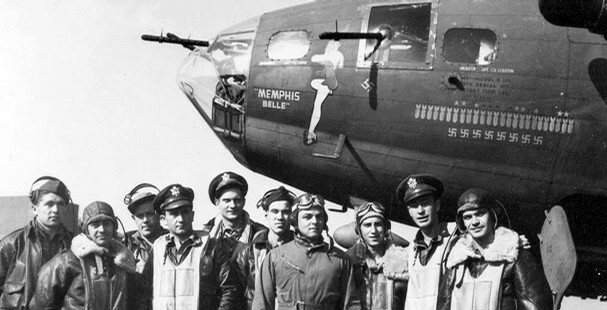 There is a neat story in The Commercial Appeal today about the continuing restoration of the Memphis Belle, the first Boeing B-17 Flying Fortress to survive 25 missions over Europe in Word War II with its crew intact. Named after the then sweetheart of the pilot, the Belle is undergoing a full restoration at the U.S. Air Force Museum in Dayton, Ohio. Today's Sunrise Serenade was "Baltimore Oriole" by Hoagy Carmichael and His Orchestra. Click on the song title to listen courtesy of Jazz On Line.